Fast-paced, restless Hard Rock with loud guitars and a restless drum beat that reflects velocity, speed and skill. 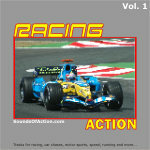 A must for racing scenes. Very fast double-bass driven industrial metal with several wild guitar riffs. A perfect match for extreme sports, racing, chases, car crashes and highlight reels. Powerful industrial rock with a steady driving beat, several heavy guitar riffs and a “low” middle and end section minus guitars. Uptempo modern Rock track with flat 5th riffs and siren-like lead guitar fills. Uptempo Hard Rock / Heavy Metal with steadily pounding drums and pushing guitar riffs, topped by speed-picked lead guitars. Uptempo (Hard) Rock with virtuoso lead guitars and a driving beat. Midtempo Hard Rock with a very steady beat and powerful rock guitar chords. A great one for monster trucks.